So it's a few days on and I wanted to update you on how the marathon relay went on Bank Holiday Monday. 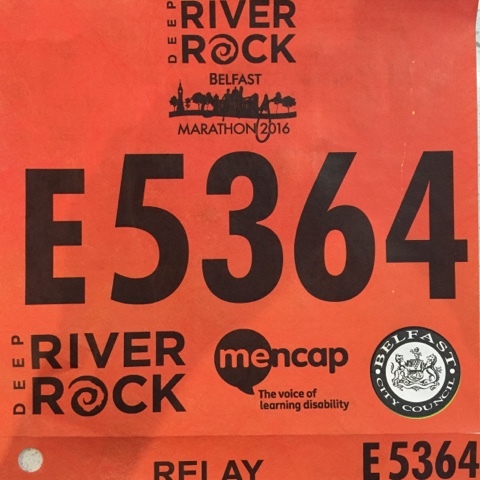 I was SO nervous preparing for the day, not just because I'd not run the distance since all my injuries and my forced break from running but also because I was co-ordinating 19 other runners who made up 4 relay teams - all from Belfast Community Gospel Choir. 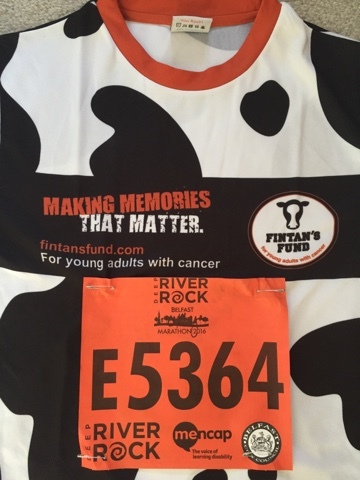 Each team ran for a different charity and my team's charity was Fintan's Fund - set up in memory of a friend's brother who died much too soon from cancer just over a year ago. Finally...I was off - second last to leave the last handover point but at least I knew that all the other 18 runners were ok - and the 19th wasn't far behind me. It was a gorgeous day so there was a huge turn-out along the streets cheering on the runners - mostly the entire marathon runners admittedly.....us relay runners had a much easier task. 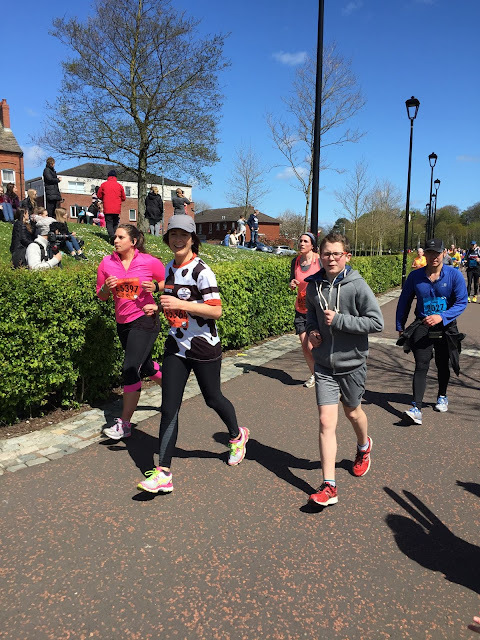 But I was happy to take all the support on offer on my 5 mile route, including running with my son for half a mile...which was really special. I always said I was just doing this to prove to myself I could be part of the Belfast Marathon again after 7 years of a break but now I think I might have the bug to do another race and perhaps a 10k this time? 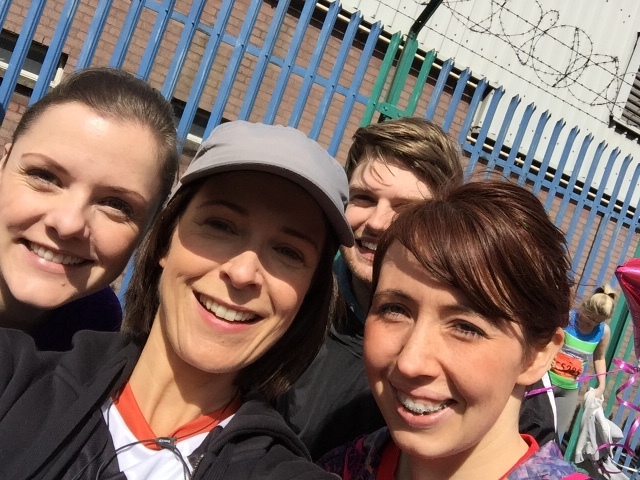 One of the girls in the photo above, Rachel, who ran for her own charity Jengana, is organising a 10k on the 21st May in Antrim so I have signed up and am going to give it a go - just to see if I can do a 10k again. Then I'll go back to the 5k and stick with that...maybe. 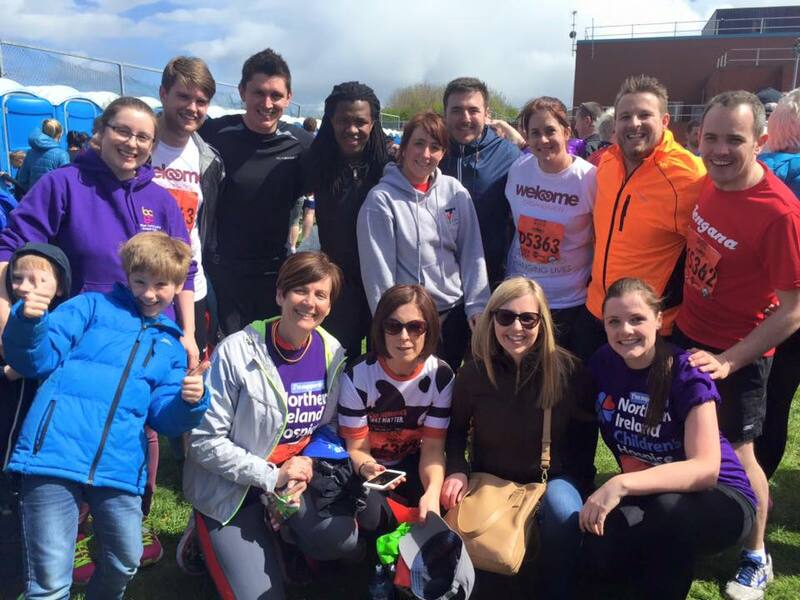 Thank you to all who donated (mostly off-line) to my team's charity. 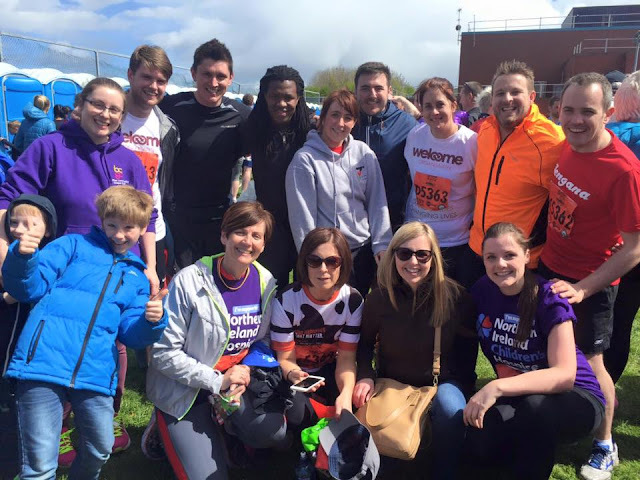 We haven't totted it all up yet but there's about £350 so far just for Fintan's Fund alone. If you'd like to add to that at all, you can do so on this link - and also read more about the charity too. Oh and if you're local and want to give the Jengana 5k fun run or 10k (less fun) run a go - here's the link for it. PS Thanks to Sportique in Magherafelt for my ASICS Nimbus trainers which have made a significant difference to my training. I know there are a number of factors contributing to my (pain-free) running at the moment, not least the amount of strength training I'm doing alongside but I know these trainers are helping hugely too....I literally bounce along in them. Never again will I buy trainers without gait analysis. You can read more about my experience having my gait analysed on this link. Am impressed, well done you. I'd be interested to hear who you've been seeing / what you've been doing to improve your overall fitness. 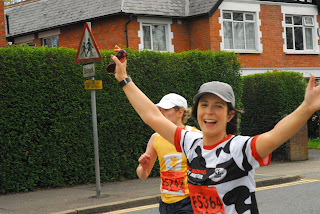 I had dreadful SPD with both boys and have recently had to give up running and my back wasn't coping with the high impact. Am v jealous! !